November Retail Hiring Falls to 6-Year Low; Down 10 Percent From Last Year | Challenger, Gray & Christmas, Inc. Retailers added fewer workers through the first two-thirds of the typical holiday hiring period, according to an analysis of employment data by global outplacement firm Challenger, Gray & Christmas, Inc. The latest data from the Bureau of Labor Statistics (BLS) showed that employment in retail grew by 371,500 in November. That was down 9.3 percent from a year ago, when jobs in the sector increased by 409,500. It was the lowest November employment increase since 2010. November followed equally anemic employment gains in October, when retailers added 154,600 workers. That figure has since been adjusted even lower to 150,300, which is 23 percent lower than the 194,800 retail employment gains recorded in October 2015. 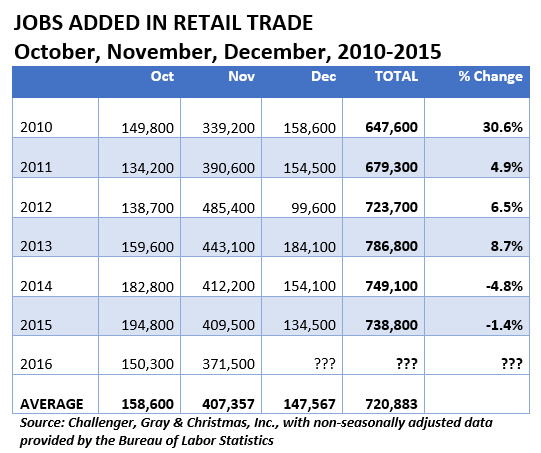 Overall retail job gains for October and November totaling 521,800 are 14 percent are fewer than the 604,300 retail jobs added last year. “As more and more shoppers move online, there is less need for extra workers in the brick and mortar stores. Even on Black Friday, once notorious for early morning mob scenes at department stores, a growing number of Americans are staying home and finding great deals on the Internet,” said John A. Challenger, chief executive officer of Challenger, Gray & Christmas. Indeed, Black Friday online orders grew nearly 22 percent to roughly $3.3 billion in sales, according to Adobe Digital Insights. While seasonal hiring is down in retail, it is picking up in other areas; namely, transportation and warehousing. Employment in the sector increased by 96,200 workers in October and November, according to BLS data. That was up from 71,300 a year ago. It is likely that the biggest job gains for this sector are yet to be reported. Last year, transportation and warehousing employment increased by 136,600 in December. “Holiday job seekers should not stop looking for opportunities, even though it is December. They must cast a wider net to include employers outside of the retail sector. However, even retailers continue to add throughout the holidays as high turnover in the industry requires nearly-constant recruiting activities. Last December, retailers added another 134,500 workers,” said Challenger.